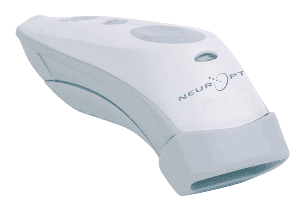 The NPi-200 Pupillometer System is a point-of-care device, however the pupillometer does not facilitate transmission of patient data into an EMR, it is not connected to an EMR, and it will not be connected to your hospital’s network. 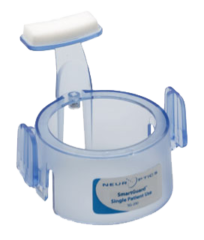 The patient information (pupil measurement data) is contained on the patient-specific disposable SmartGuard® product that has an embedded RFID smart card memory tag. The patient data on the SmartGuard is not able to be exported in HL7 protocol. As with all other point-of-care devices (ie: ventilators, glucometers, etc.) whose biometric feeds or patient data must be converted into HL7, the patient’s pupil measurements contained on the SmartGuard must also be converted into HL7 to upload into your EMR. To facilitate transmission of the patient data on the disposable SmartGuard into any EMR system, it will require a device driver provided by a third party (ie: Capsule Technologies, iSirona/Nanthealth, Cerner, etc.) of which will be specified by you and your IT department. The NPi-200 Pupillometer System uses RFID (radio frequency identification) technology to transfer data between the pupillometer and the SmartGuard®. RFID facilitates data collection at high speed using low wattage (13.56 MHz) radio frequency to read from and write to the SmartGuard memory. Incorporated into the design of the NPi-200 Pupillometer is a radio frequency (RF) antenna which broadcasts patient data information to the SmartGuard. The disposable SmartGuard incorporates a 4K RFID technology manufactured by Mifare. The memory consists of a sequence of blocks each containing a pair of measurements from the left and right eye. Each pair is time-stamped and contains the pupillary variables from both the left and right eyes. The Mifare 4K memory can store up to 168 paired measurements. 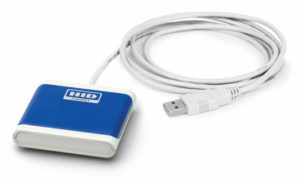 Data saved in the memory can be accessed using a RFID reader device (SmartGuard Reader). To program a new SmartGuard, attach a SmartGuard to the NPi-200 Pupillometer. Enter the patient identification (ID) number either by manual entry or by using the NeurOptics® Antimicrobial Barcode Scanner. If using the scanner, scan the barcode printed on the patient’s wristband to write the patient ID into both the Pupillometer and the SmartGuard memory. Every valid pupillary measurement made with NPi-200 will be saved into the SmartGuard memory. The NeurOptics Antimicrobial Barcode Scanner (BCS-CC-01) is compatible with 1D (one dimensional) linear barcode technology. The NeurOptics Antimicrobial Barcode Scanner (BCS-CC-02) is compatible with both 1D and 2D barcode technology. If your clinical staff prefers to enter the patient ID number by manual entry into the NPi-200 Pupillometer, they can as described in our Instructions for Use and our Quick Start User Guide. The SmartGuard Reader (SGR-01-xxxx) is manufactured by Omnikey HID. Several Omnikey reader model numbers can be utilized, depending on the facility’s Device Driver Interface (DDI) requirements. Host interface is USB. Please contact your NeurOptics representative, or Customer Service for additional information (866-99-PUPIL). 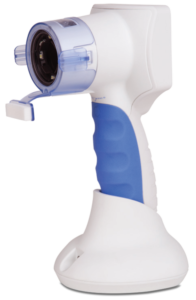 The NPi-200 Pupillometer System is a point-of-care standalone device which is EMR-enabled but reliant on a driver interface to the hospital EMR system. 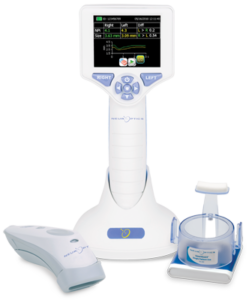 Please contact your EMR or middleware provider to obtain the appropriate driver or software plug-in for the NeurOptics NPi-200 Pupillometer. If your EMR service provider has not already written the pupillometer interface, NeurOptics will provide the necessary data protocols upon request. The main EMR application runs in the background of the EMR module or computer and it can access and read data in the SmartGuard memory using the SmartGuard Reader and the associated driver for software interface. Data is then sent to the host computer using standard protocols (ie: HL7). The application in the host computer updates the EMR system with the uploaded information received from the EMR module. To prepare for the installation of the new technology into the clinical environment, please provide your NeurOptics representative with a non-confidential patient ID wristband which will allow us to validate and verify barcode data structure compatibility. Manual pupil assessments (penlight) are subjective and fraught with a high degree of inter-examiner variability. It is well documented that automated pupillary assessment solves these problems, but manual pupil assessment can also take more time than automated pupillometry and little has been discussed about this. A paired assessment with the pupillometer takes a clinician about 15 seconds. Manual pupil assessment can be confounded by several issues: Visual acuity of the examiner, dark eyes or small pupils of the patient, ambient light conditions and the subjectivity and skill/experience level of the examiner. As a result, in some patients, a clinician will often pass the penlight multiple times to try and confirm what he/she sees and a manual assessment can take even more time. In other cases, if the clinician is not sure, or if there is a suspected pupil change, another opinion might be sought. This involves an additional person and several minutes more of time. As a single measurement, these differences might not seem meaningful but given the frequency of pupil exams, these differences are significant over time. Some clinicians will complete the exam and immediately record the pupil measurement data into the terminal, while others will complete the pupil exam, continue with necessary patient care, and then later go to the terminal, log in, input the data and log out. Nurses at a high volume neuro ICU were recently timed and, on average, these charting and data entry steps took about one minute. Automatic data upload will eliminate the need to manually chart and input data. Utilization of pupillometry has been shown to decrease nursing workload and is associated with time savings compared to manual assessments (1). 1. Wilkie, A: Nursing time savings study: Pupillary assessment times. Poster presentation, 2015.